When I was in Moscow this last September, I got to know a bit better one a Russian airline that had always intrigued me, and not only because it flies to some very interesting destinations. I am talking about UTair. UTair is, actually, not just an airline, but a group of companies providing a number of aviation-related services. UTair was founded during Soviet times in the "oil city" of Tyumen and until 2002 was known as Tyumenaviatrans. And, although the UTair of today is quite a diversified company, these West Siberian origins, in the most important oil-producing region of Russia, have profoundly marked the structure, network and operations of the UTair of today. UTair's home is in Western Siberia. No wonder that, although it is Russia's third largest airline, UTair remains relatively unknown outside Russia. In that region, UTair operates many air links to isolated and remote communities under public service contracts. In many of these routes UTair is the only operator (and pretty much the only link to the rest of the World!). Maybe because of these origins, serving scattered communities across Russia, far from the centralizing influence of Moscow, that UTair has developed quite a decentralized network structure, with plenty of point-to-point routes across the fours corners of Russia. Its operations are no longer constrained to Siberia, but it operates plenty of routes in the European side of the country, including quite a busy base at Moscow's Vnukovo airport, the Russian Far East and internationally. For example, UTair has been quite succesful in opening new routes between Russian regional airports and some European destinations, like for example from Rostov-on-Don, in Southern Russia, to Frankfurt-am-Main, in Germany. It has also signed an agreement with Transaero that allows both airlines to coordinate some of its operations at Moscow's Vnukovo airport, facilitating passenger transfers between the UTair and Transaero, while taking advantge of the complementariety of their respective domestic and international networks. UTair has been growing fast, along the general growth of Russia's air travel market. No wonder it has quite an ambitious fleet renewal plan currently under way. Before the end of this year the last of UTair's Tu-154s are going to be retired as the new A321s, B737s and Sukhoi Superjets SSJ100 it already has on order, start to arrive. What are these aircraft for? During my visit to the company I took the opportunity to ask sources at UTAir about teh airline's development plans and, in particular, about the expected development of a low cost airline market in Russia, led by Aeroflot's announced low cost subsidiary. As it turns out, UTair is not planning to launch a low cost airline of its own in the near future, as it considers that the obstacles that remain are still significant...but...it is ready to experiment with some elements of the low cost model. For example, their new airbus A321s will be configured with a dense-seat plan, for up to 220 passengers in a single class. UTair is also considerint setting up a base at Yermolino airport, a former military airfield about 100km South-West of Moscow that is expected to become a civilian airport sometime soon. This move, however, is still far from certain because rail and road links need to be completed, and a new passenger built, before it can act as a secondary airport for the Moscow area. If the required infrastructure is completed, UTair would be ready to base up to 20 aircraft at Ermolino, something that could certainly have an important effect on the airport dynamics of the Moscow region and pave the way for would-be low cost airlines to use this airport too. 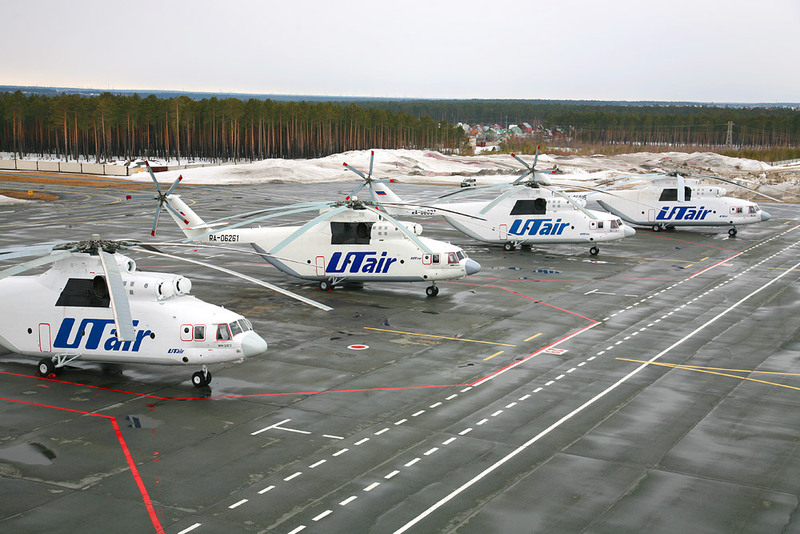 But if there is an area where UTair is really one of a kind, it is in the helicopter services market, where it operates both domestically and internationally. UTAir operates a fleet of over 350 helicopters, which make it the largest civilian fleet in the World in terms of weight-lifting capacity. UTair helicopters are active not only in Russia, where they play an essential role supplying the Siberian oil industry, but all around the World, be it in support of UN missions in Africa or fighting fires in the summer in Spain. When you speak with people at UTair, you really feel how proud they are of their helicopter operation and, how, in a way, it is a strong component of the company's "dna". It is certainly something that sets them apart from many other airlines. Just to give you an idea of the importance of helicopter operations for UTair, it accounts close to 40% of the company's revenue, with more than 80% of this being accounted for by flights in support of the oil industry.